We had a delightful visit with Eamon and, over a scrumptious lunch prepared by Pauline, renewed our family connections. Our visit was well-timed since we also meet Eamon and Pauline’s daughter Niamh and her 3 children who were visiting at the time. 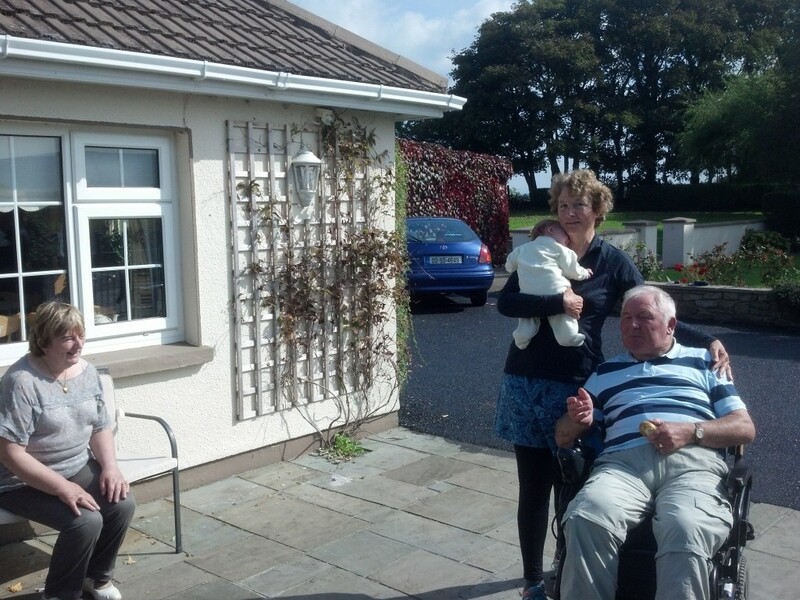 Cousin Eamon with me and his granddaughter, his wife, Pauline is on the bench. Leaving Eamon’s house we traveled down the roads that Eamon describes so well in his “Scooter” book. Eamon amazes me with his knowledge of the history of the area and how well he weaves the local community, its resources, geography, and “Local Color” into the fabric of life that covers the pages of his books. Places we passed came to life like High Park School (which Eamon helped construct), Augris Head and The Beach Bar where we stopped to enjoy a pint and a coke. Our travels around Ireland captured so many beautiful sights too numerous to mention – but one of the most striking to us was Connemara… a secret treasure. People along the way would ask us what part of Ireland we liked best. It was a very difficult question to answer as there were so many “great places”. 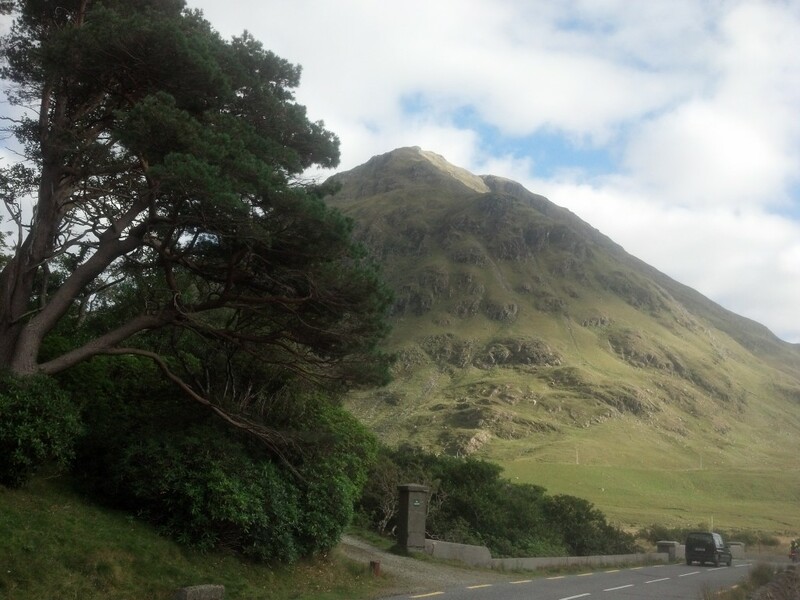 Certainly one of the best, if not the best, was Doolough Pass, It’s beauty left us astounded since no one had mentioned Connemara and Killary Harbour as places we should visit. 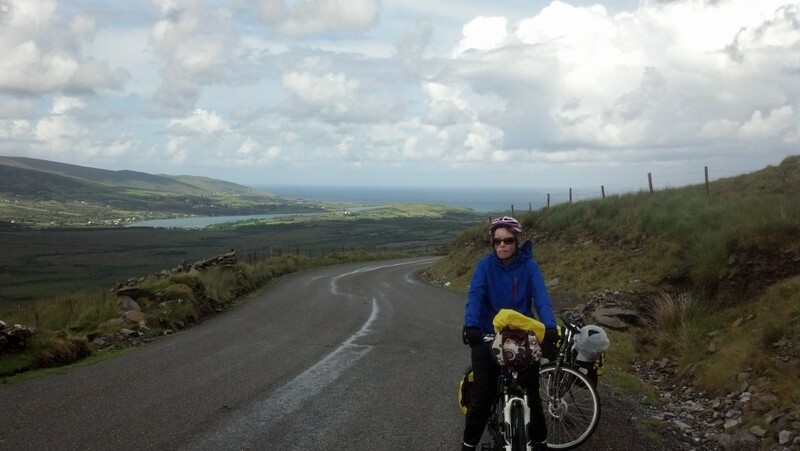 We cycled southeast from Cleggan and arrived at the entrance to the pass about 4 o’clock in the afternoon. The way the autumn light played on the mountainsides and mirrored the lakes was beautiful beyond words or the photos we took. Traveling at a cyclist’s pace allowed us so much more time to appreciate and absorb the beauty of the place. Taking in the sights, sounds, and smells and noting the velvety texture of the mountainsides would not have been possible in a car. As the trees appeared at the far end of the lakes, we thought we were in another country – this area was so different from the Ireland we had previously seen. As we came to the end of the pass and entered Killary Harbor, we encountered the rippling waters of Ireland’s fjord. 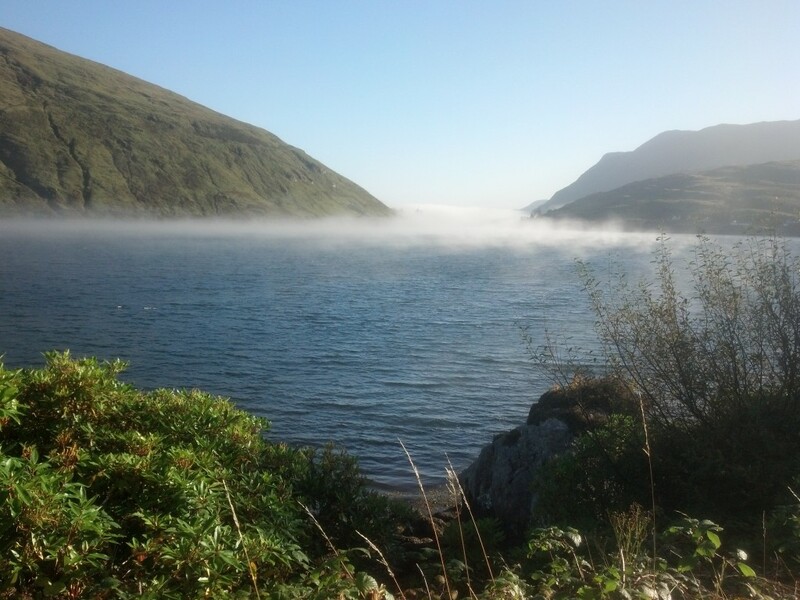 Without a doubt, Doolough Pass has a natural, unspoiled beauty that no visitor to Ireland should miss. A quote from Bruce Weber, another cyclist, “you find yourself in a place where something has happened,” also reflects our experience in Ireland. In Ireland, you can’t go many miles without a sign or indicator of some event in Ireland’s history. Each day we passed tombs, dolmens, religious shrines, ruins, museums, famine villages, and indicators of emigration and “The Troubles”. 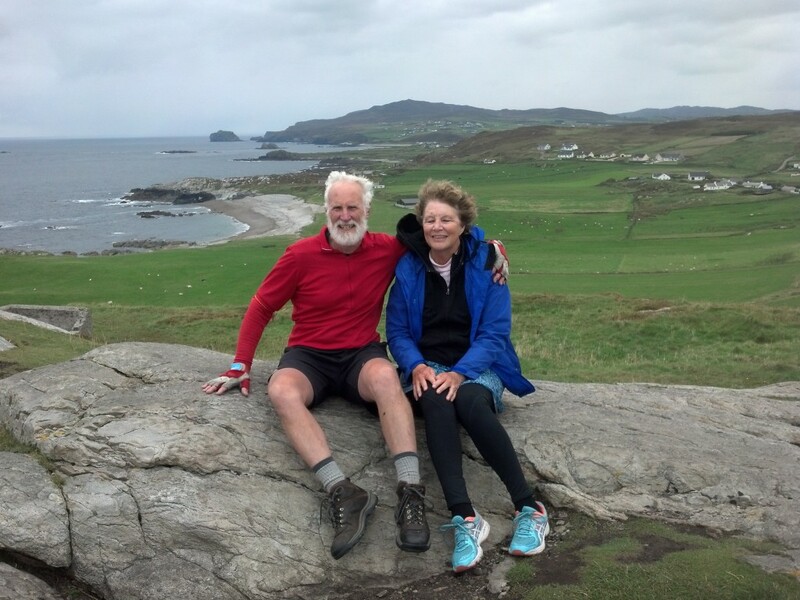 Our first few weeks, or was it a month, took us around the many southern peninsulas, including Dingle, Iveragh (Ring of Kerry), Beara and on to Mizzen Head with a hope of a tour of the Fastnet lighthouse. 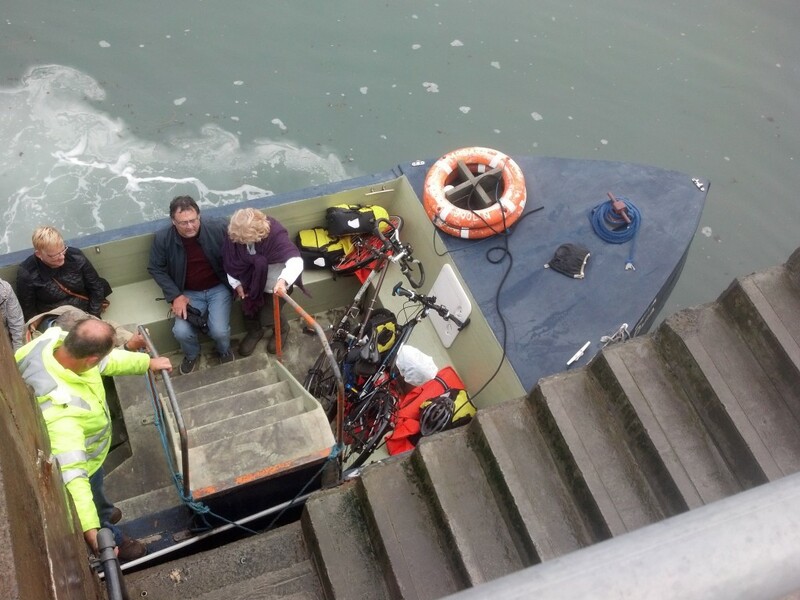 Unfortunately, the Fastnet tour wasn’t to be since an assembly of police officers were taking an Irish language course on Clear Island and had filled the boat tour. Maybe next time. Living in the flat lands of Virginia, I hadn’t had an opportunity to train for steep climbs. Climbing the first pass (Connor Pass) took two hours for this ill prepared but determined cyclist, catching my breath every tenth of a mile up, cresting the top to the applause of another cyclist, and cycling down in 25 minutes into Dingle. 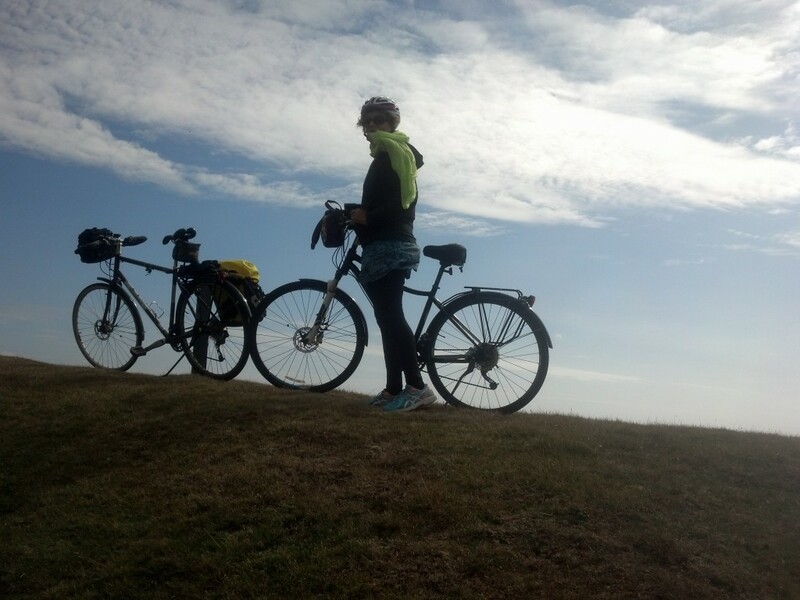 Weeks later, as we traveled our last few kilometers towards Wexford, my husband and I decided that we had a reasonable idea of the distance we were capable of riding each day. Plugging in that daily distance, we mapped out our route for the eastern side of Ireland. Other travelers had forewarned us of an American football game taking place in Dublin on the upcoming weekend with the resultant lack of lodging in and around Dublin. With this knowledge we made our plans to circumvent the city (not a major loss since we had toured Dublin during our ’94 trip and much prefer the small towns anyway). 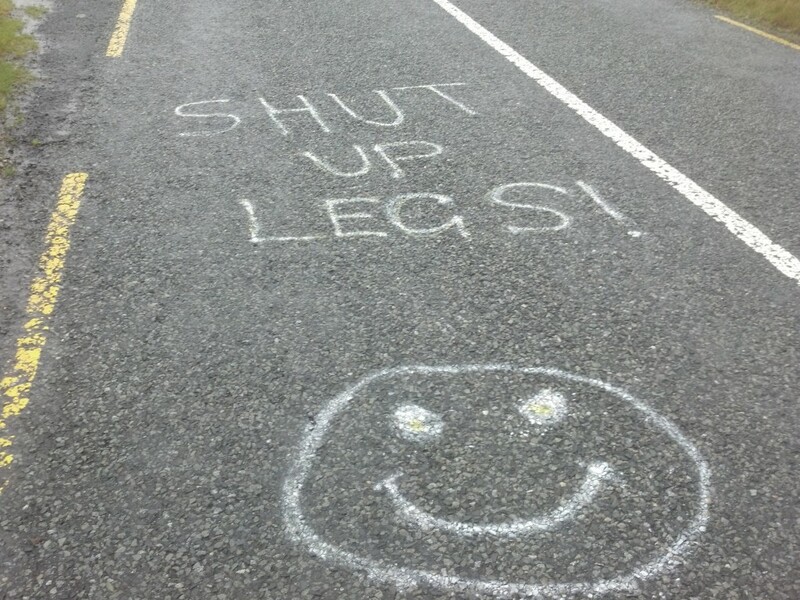 Skirting Dublin included cycling over Wicklow gap which gave me some concern after my huffing and puffing up Connor Pass. Not to worry, several weeks of cycling and hill climbing resulted in the climb being much easier than Connor Pass – despite the length and altitude. From there it was up the East coast, on to Newry where we picked up the Newry Towpath leading to Portadown, which was a delight after traveling the busy roads. 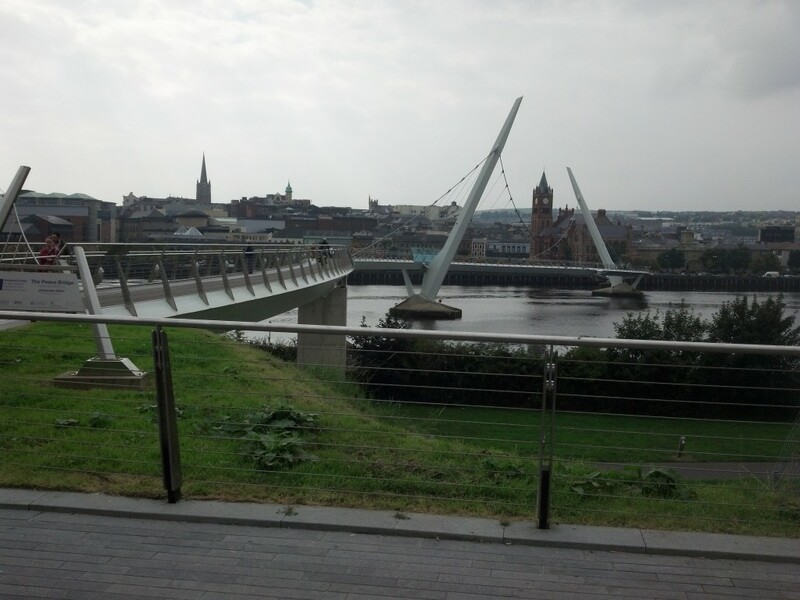 A short visit in Derry and we were back in the Republic and headed to Malin Head. 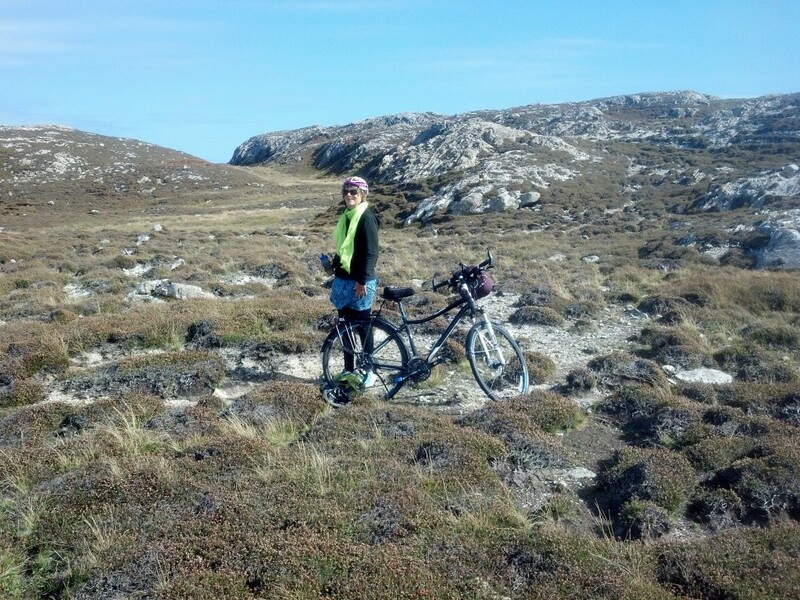 On our travels we crossed paths with several cyclists that were participating in a 7 day ride from Mizzen Head to Malin Head. 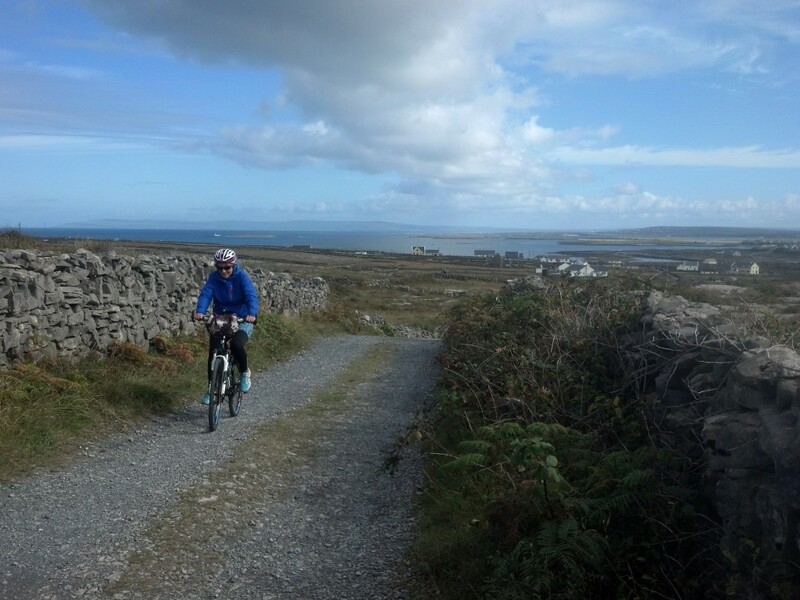 It took us 17 days to complete our Mizzen Head to Malin Head ride, but in fairness, we did do it the long way around. Leaving Malin Head we picked back up on the Wild Atlantic Way and began to allot our remaining days so that we could include a stopover in Sligo and still make it back to Shannon for our flight home. “Do you know Eamon Carney?” “He’s my cousin.” Oh, sure; and doesn’t everybody from America have a “cousin” in Ireland. 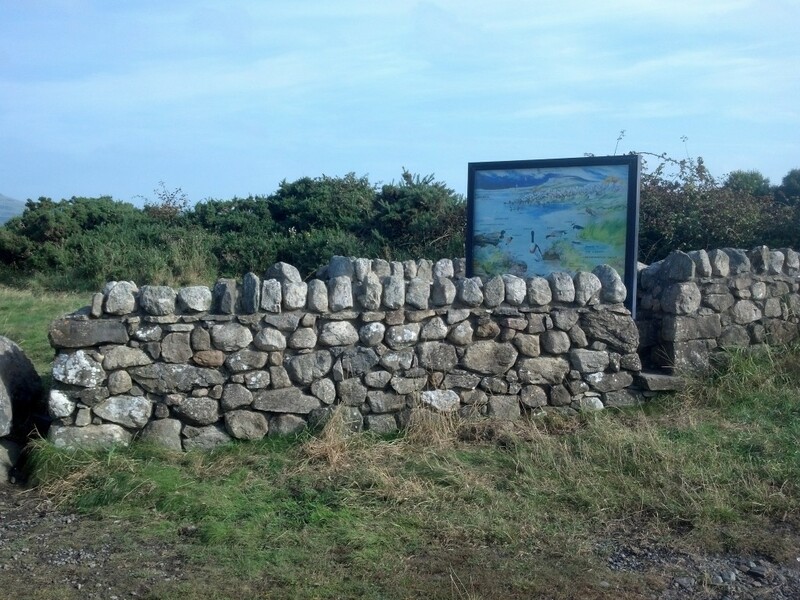 Such were the beginnings of conversations as we cycled around Ireland this summer and “connected” with the locals in the County Sligo area. 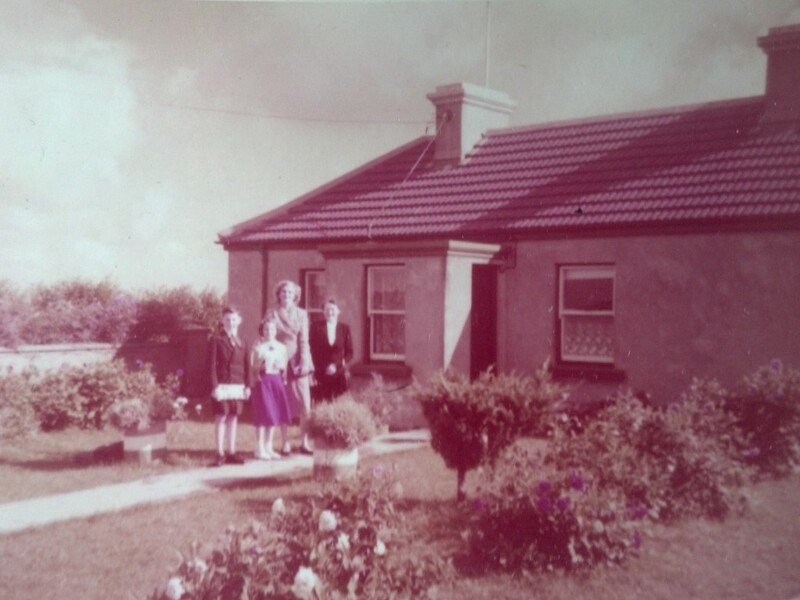 When I was 7 years old in 1956, my parents and I visited my mother’s relatives (her aunt Mary and Cousin Eamon Carney,) in County Sligo and my mother’s father’s relatives, (the Smith clan,) in County Waterford. At that time, my father was stationed in Paris with the US Navy so the trip to Ireland was a short one. My next visit was planned with my husband in 1994 to celebrate our 25th wedding anniversary by taking a two week cycling trip in Ireland. Unfortunately a broken ankle changed our mode of travel to a rental car. During this trip we visited with my cousin, Eamon Carney and his lovely wife, Pauline, and all their children. 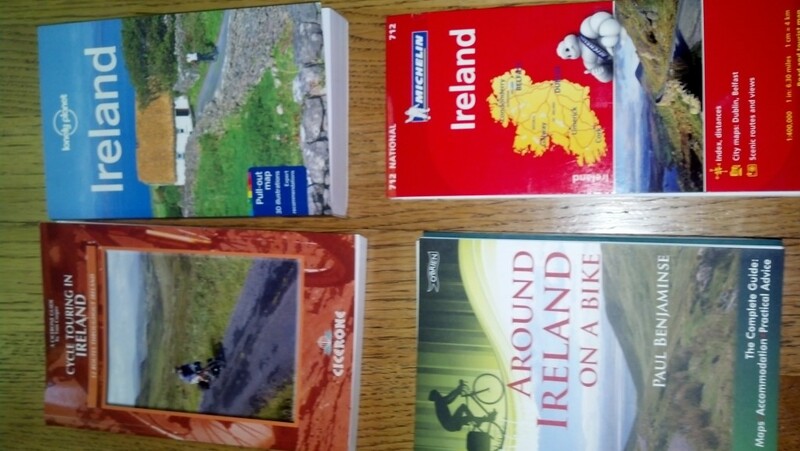 In 2014 I rediscovered the joys of long distance cycling while on a 2 week cycling pilgrimage in Spain and promptly retired so we could follow through with the cycling trip of Ireland that I missed in 1994. 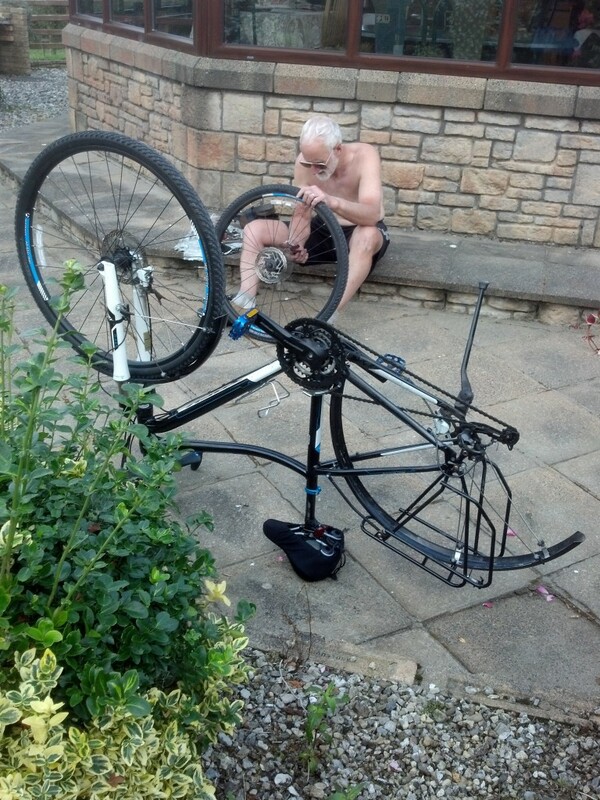 My husband made all the enquiries and purchased the bikes, pannier bags, tickets, and necessary gear. 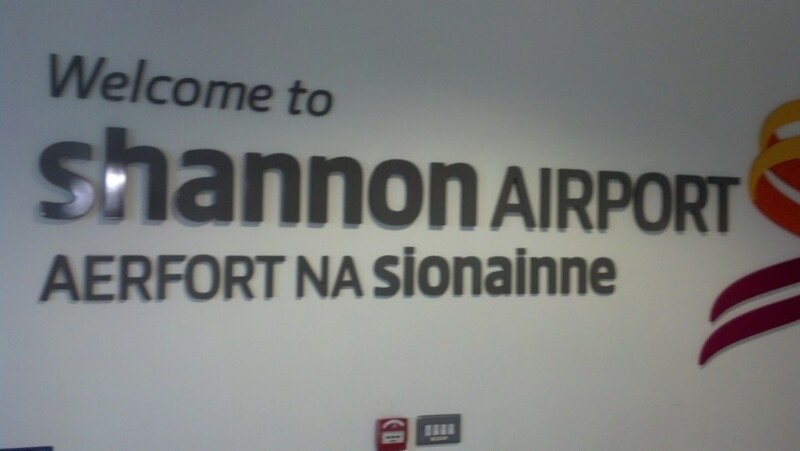 Our plane landed in Shannon on August 6th and our adventures began. 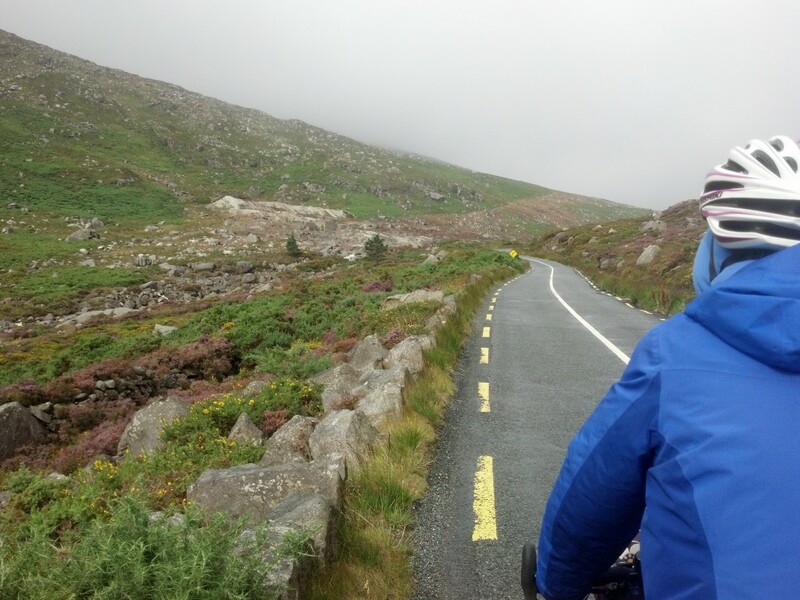 Unfortunately, the Irish Government limited to two months our touring visit in their beautiful country and so we determined to cycle around the country getting as far as we could. If our cycling didn’t get us back to Shannon in time for our return flight, we were prepared to catch a train or bus to Shannon in time for our return flight. 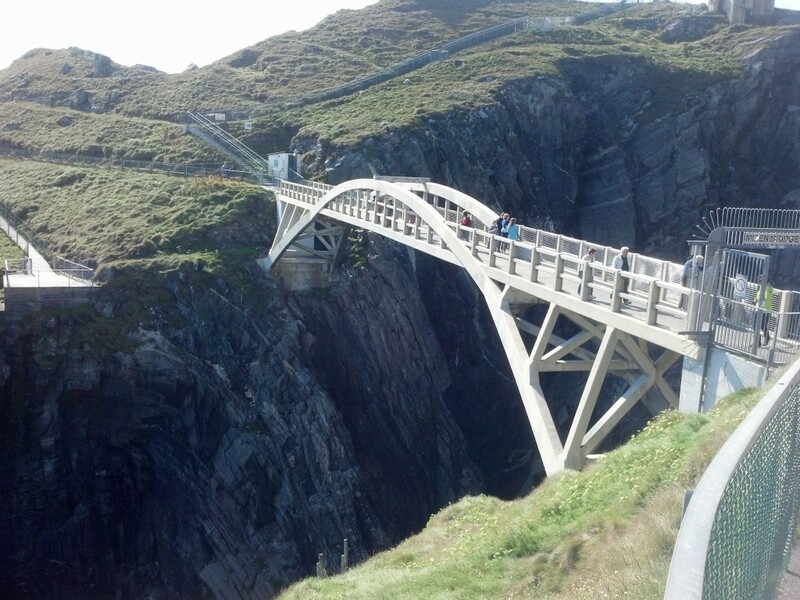 Our travels took us to several islands that also offered a different perspective of Ireland. Not having had the leisure to visit them during our 1994 trip, we marveled at the different geographies of these rocky outposts in the ocean. 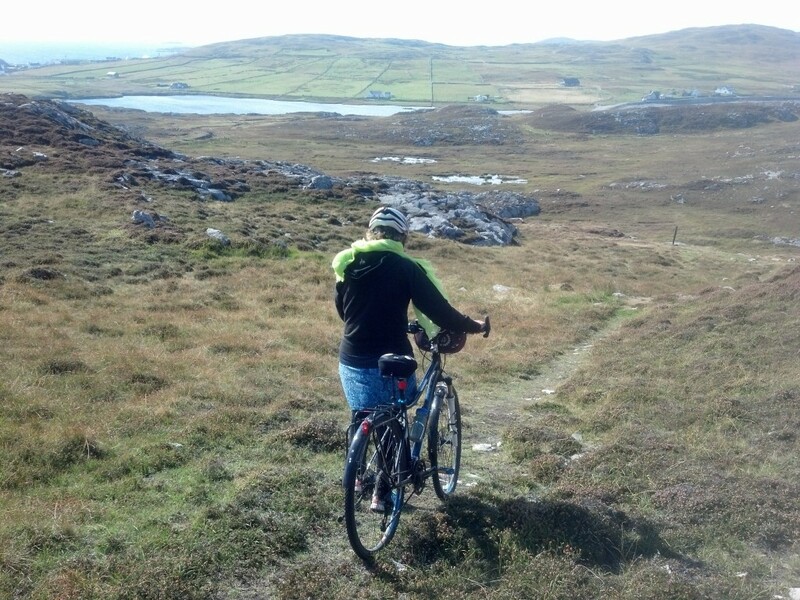 Beginning with Achill Island, which we accessed by way of the Western Greenway (another amazing cycleway) and a bridge, ferrying out to Clare Island, Inishbofin, Inishmoir returning to the mainland through Doolin. While all of the islands were distinctive in their geography, their people shared an obvious pride in their self-sufficiency. Having only visited the islands as a tourist during the “sunny season,” I am left to wonder what the winters are like.